A brief (less than a minute) "lightgun shooter" style game made for the 48-hour Extra Game Jam. Eliminate all "computer viruses" from the infected sector before they can swarm you. There were two main challenges for this project. The first was the 2D antagonists who had to be made to always face the camera and take visible damage to the head and chest when shot (the latter was accomplished by swapping images on the skeletal sprite when an invisible 3D object was shot). 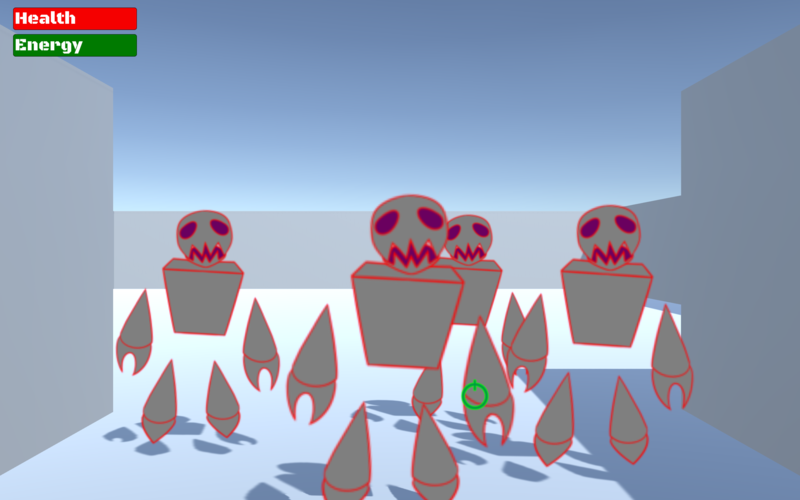 The second was the method for controlling the 3D camera; it used custom objects that defined a scene (any place the camera stopped to let the player shoot), containing a list of enemies in that scene, the camera animation that moved it into shooting position, and the object defining the next scene. A controller object would trigger the next scene once all enemies in a scene were killed, moving the camera into the next position and activating the movement on that scene's enemies. Due to the 48-hour time limit, several features were cut. One was making the enemies viewable from different angles (though art for the other angles exists). Another feature was allowing the arms and legs to be shot (though again, damaged images for the limbs were made). Finally, there were also to be "innocent programs" that a virus might target instead of the player. These innocents could be rescued by killing the attacking virus, killed by a poorly-aimed shot from the player, or killed by the virus, who would then target the player.